On the contrary of previous Windows operating system releases, MSI dishes out its newest tablet that is infused with Android 2.3 codename Gingerbread. The MSI Windpad Enjoy 7! 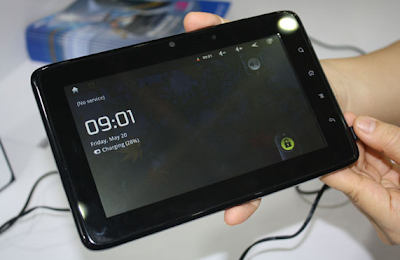 This 7-incher tablet was announced in Computex Taiwan last June and is now in Philippine shores for Php 11,995. It has a slight inconsistency though with regards to its $199 (Php 8, 500). However it comes as a great deal in the low-price your mid-range tablet department. Yugatech also stated that it looks like a “little chunky” being a 0.9-pounder tablet. Well, it’s not as cheap as the Cherry Pad but certainly a device to be considered these holidays.Check out the full specs after the jump.